Looking for a four-ingredient meal that’s quick and delicious? 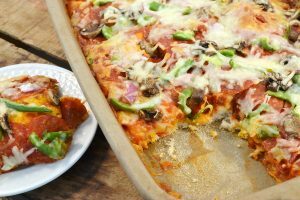 Then you’ve found it with this incredible easy puffy pizza bake! 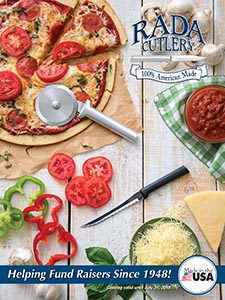 Featuring flaky biscuit dough, sweet tomato sauce, and your favorite pizza toppings, this tasty 4-ingredient pizza bake have your family begging you to make it again and again. Preheat oven to 375 degrees. 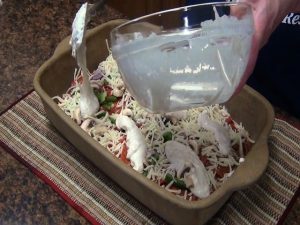 Coat a 9″ x 13″ pan with cooking spray (unless using a stoneware pan). Empty biscuit mix into a medium bowl and add 1 cup water. Stir. 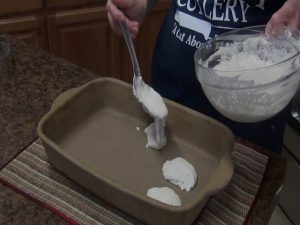 Drop half of the dough by spoon into the baking dish. Drizzle half bottle of pizza sauce over the dough. Arrange half of the pepperoni over the sauce. Add vegetables and other ingredients of your choice. Top with 1 cup shredded cheese. Repeat layers. Bake 20 to 25 minutes or until golden brown. 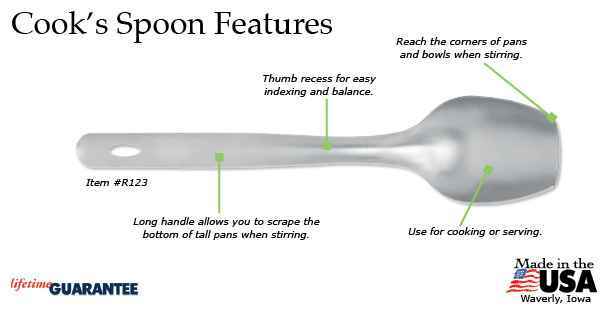 You won’t have to worry about draining liquids when you use the Rada Cook’s Spoon! It’s perfect for draining fruits or pasta, or for serving at the dinner table. The comfortable handle allows for easy usage, and it’s proudly made in the USA with a Lifetime Guarantee! 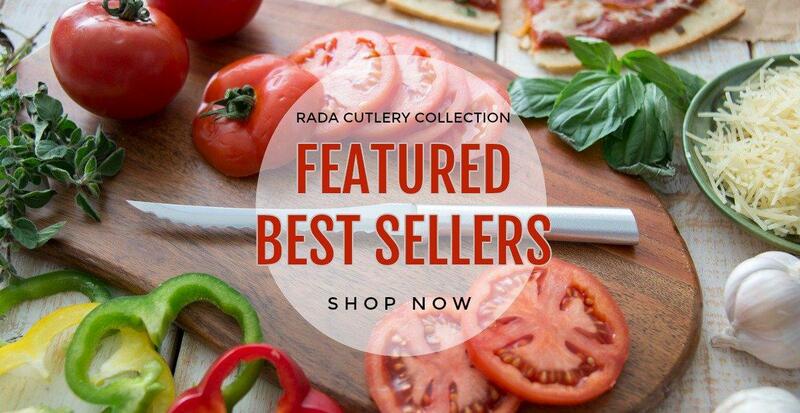 Stop by the online Rada Kitchen Store to order your own Rada Cook’s Spoon! 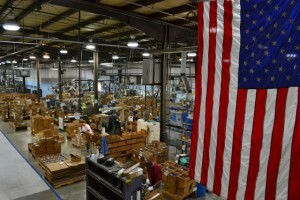 Everything you buy from Rada Cutlery is 100% made in the USA, meaning that your purchases support American workers and industry. 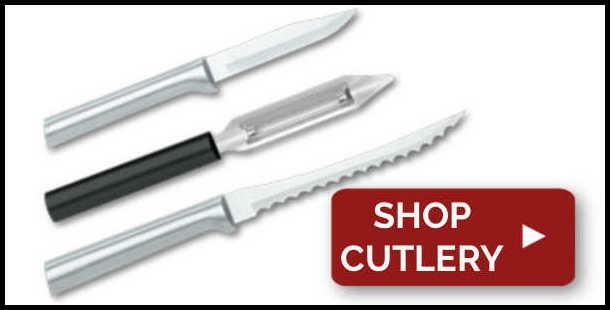 All of our cutlery comes with a Lifetime Guarantee, meaning you can buy with confidence! Watch this video to see how the skill of our workers makes Rada products so incredible! 1. The Best Customer Service – Rada is a company built on fundraising, and its customer service reflects that. Rada’s representatives are committed to ensuring that each and every one of its fundraisers is a success! 2. 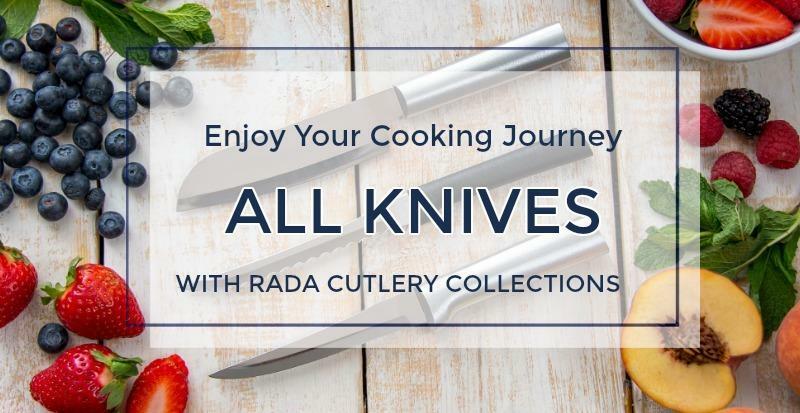 Wonderful Products People Actually Want – Rada’s knives and kitchen utensils are all backed by an ironclad Lifetime Guarantee, ensuring consistent quality for as long as they’re used. People enjoy these products so much that they often request that more fundraisers be held just so they can purchase more! 3. Enormous Profits on Sales – Whereas most fundraising programs offer small profits, Rada fundraisers guarantee an astounding 40% profit on each sale. 4. Three Ways to Sell – Every nonprofit group has a unique circumstance, and Rada is there to meet its requirements with three different sales methods. There’s traditional catalog sales, which see group members offering Rada’s appealing catalog to potential supporters. Groups can also host event sales, which see team members offering Rada for sale at events such as sports games and church services. 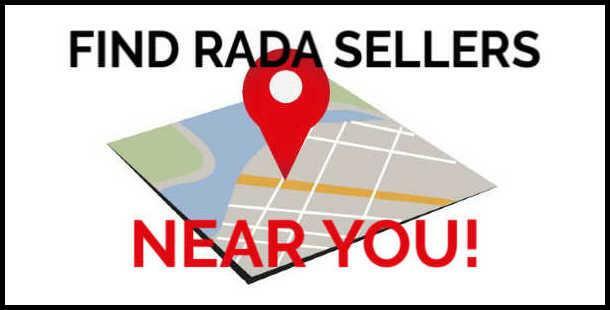 And then there’s Rada’s cutting-edge online sales, which allows your group to reach out and offer Rada products to supporters across the world. 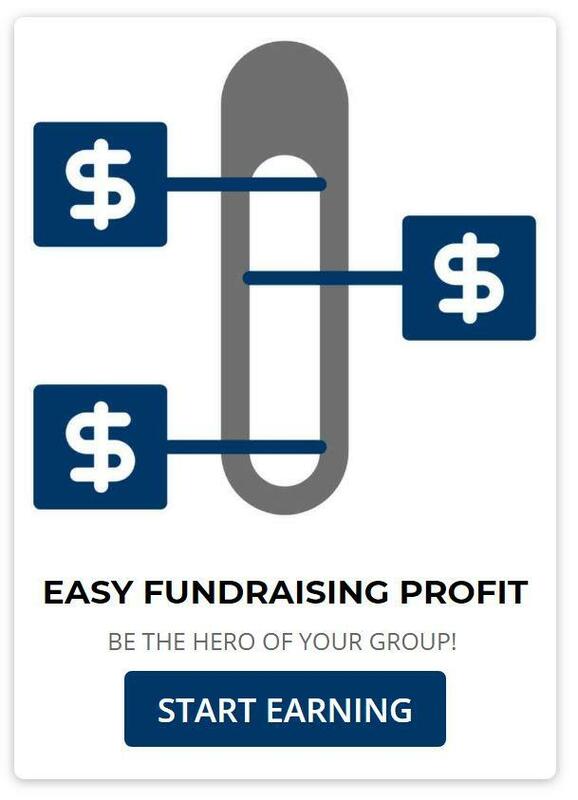 Use one, two, or all three sales methods to maximize your group’s profit. 5. 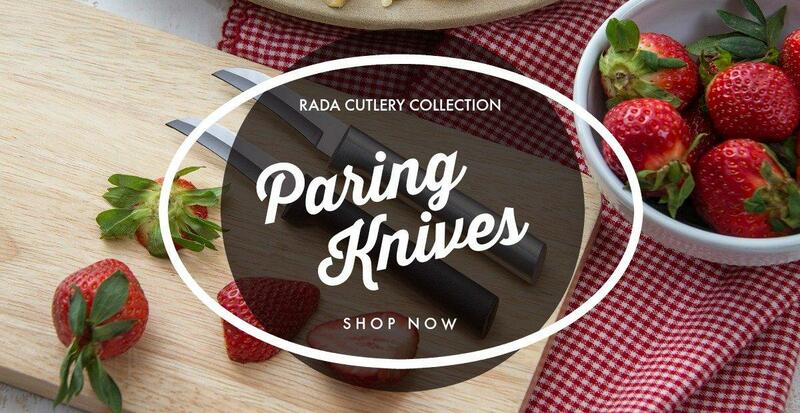 USA-Made Cutlery – Every Rada product is made entirely in the USA. 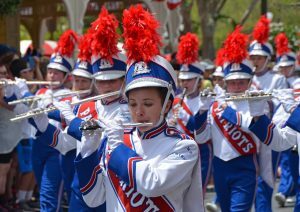 American workers craft each item with unmatched skill, making products your group and its supporters can be proud of. 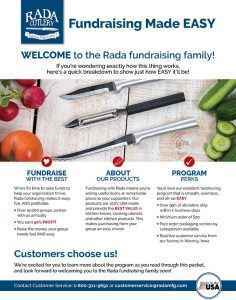 Stop by Rada’s website to learn more about how our employees’ skill and dedication make Rada products the best for your fundraiser! 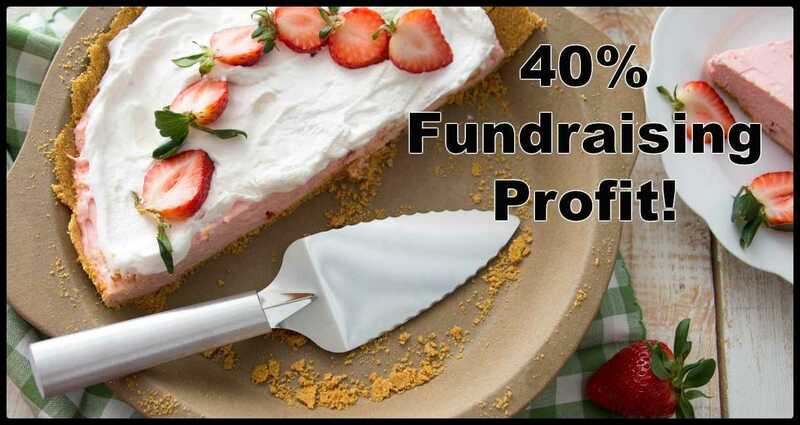 Visit Rada Cutlery’s fundraising website to get your Rada Cutlery fundraiser started! 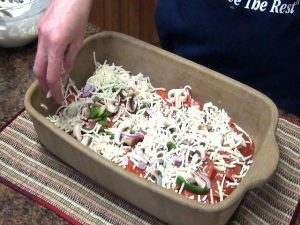 Hi, it’s Kristi in the Rada Cutlery kitchen, and today I want to show you how to make a puffy pizza bake. 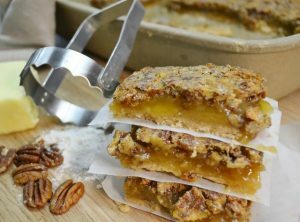 This is one of the recipes out of our 4 to 1 Cookbook. First, preheat your oven to 375 degrees. Coat a 9 by 13 inch baking dish with cooking spray. If you use the Rada Rectangular Baker stoneware pan, it doesn’t need any pre-seasoning. Empty 2 cups biscuit mix and 1 cup water into a medium bowl and stir. 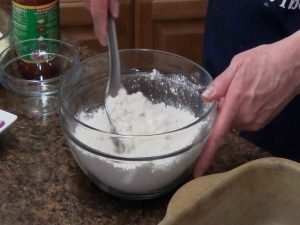 Drop half of the dough by spoonful into the bottom of the baking dish. Don’t worry if it doesn’t cover the bottom completely. 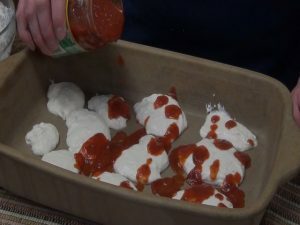 Drizzle half a bottle of pizza sauce over the dough. 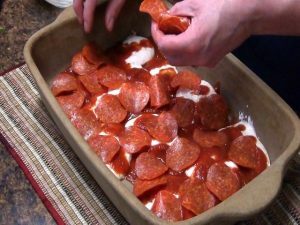 Arrange half a package of pepperoni slices evenly over the sauce. Add extra ingredients of your choice. Top with 1 cup of shredded mozzarella cheese. 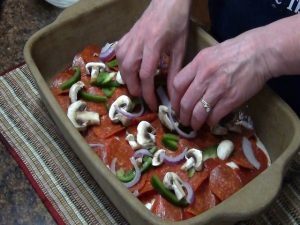 Repeat layer with remaining dough, sauce, pepperoni, other ingredients, and cheese. Bake for 20 to 25 minutes or until golden brown. 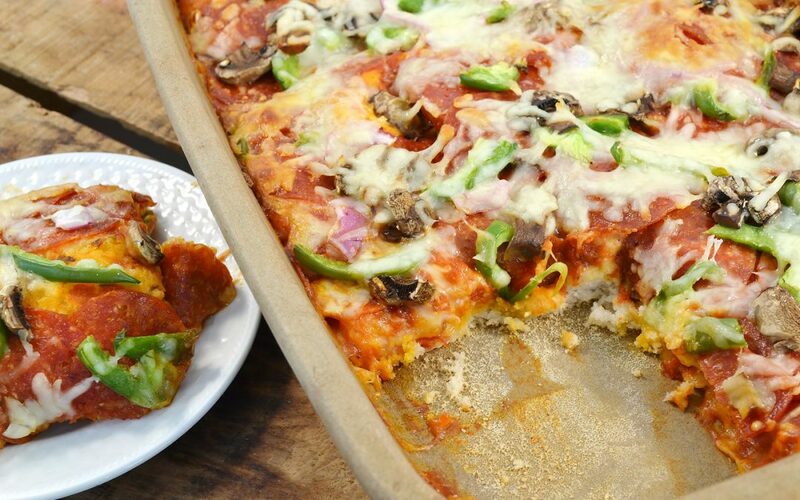 And there you have a delicious, easy-to-make puffy pizza bake. Be sure to subscribe to our YouTube channel, and visit us at our website at RadaCutlery.com.